If researchers start with the idea that language and culture are complex, and that linguistic practices are generally very sophisticated, we’ll do a better job understanding and investigating these things. Ahem. Normally, language use is unimodal, using only one set of signs to communicate what is in the speaker’s brain in order that it may be received and understood in the listener’s brain. The speaker and the listener can understand the signs because they both know them all. It would be impossible for multiple sets of signs to be used frequently, as some have so breathlessly claimed, because that would be way too much to remember. Similar to Horace Miner’s (1956) exploration of magical culture among the Nacirema, it is hoped that the present analysis can be seen “as an example of the extremes to which human behavior can go” (p. 503). If the reader is unfamiliar with Miner’s work, I humbly suggest that you read his (short) essay, for it will put heteroglossia in water signage among the Nnepu in its proper context. Truly it is a fine example of the possibilities of anthropology to uncover the weirdest and most atypical human behavior from the farthest corners of the globe. Similar to the extreme degree of magical thinking found among the Nacirema, there is a considerable amount of heteroglossic work found in the water signage of the Nnepu. The Nnepu reside in a semi-autonomous polity interterminous with a large US city. The Nnepu retain some features of a sovereign nation, including an office of the President, a semi-independent security force, and so on. Nnepu territory is comprised of both freestanding structures and open areas. Its borders are porous in terms of the movement and people and goods, but Nnepu territory is still easily apparent to visual inspection. Within Nnepu structures, there exist a variety of devices from which citizens or visitors are free to withdraw water. These may be mechanically independent of the structure’s main water infrastructure, in the case of water coolers, or integrated in the case of water fountains. There are also devices that are shaped like water coolers and yet are mechanically integrated, so as to still be water fountains. Whether this hybridity is symbolically significant is unknown to scholars at this time. Both devices dispense water, but only water fountains have drains that allow the outflow of waste water. (Waste water is a term used to denote both water that does not successfully enter the mouth during a drinking act, and water, or even other fluids, such as cold coffee, that are being discarded for some other reason.) The use of these drains, or the display of the absence of a drain, is highly regulated by various compositions of multimodal signs. These signs are quite unusual in their use of multiple modalities, which may normally be too difficult to employ or interpret with any regularity. Indeed, multimodality has so far been mainly documented in rare, complex performances, such as dancing while singing translingually in front of a video collage. So naturally it is assumed that there is special training required to be initiated into the Drain Mysteries. Or perhaps there is some kind of oppositional youth culture involved. The sheer complexity of Nnepu water signage indicates its reach must be restricted in some way. In this sign, found in the Notsuoh building, the watermaster has chosen a coordination of cursive font, italic script, white paper, lamination, and two font sizes (large main text and a smaller expression of gratitude.) All these visual choices carry particular social meaning for the Nnepu. Further, unlike other signs which we will also see, the watermaster of Notsuoh has used two expressions of politeness, “please” and “thank you.” The word “refrain” also signals aspects of a more formalized and polite register. Truly the expertise of this semiotic tapestry is astonishing. As a show of the variety of choices which are made by Nnepu watermasters, consider this from Smailliw Building, which is evidently under the control of a far more direct watermaster, and which is also apparently beset by an overabundance of chicken bones. Note also that the Smailliw watermaster has used capital letters, tildes as list item separators, no lamination, and apparently a sticker maker instead of paper. Do these features not show us a different sort of watermaster than those of Notsuoh? The catalog of signs and meanings commanded by watermasters in their drain-labelling craft is indeed impressive. Turning now to water coolers, we see the same sorts of variety in linguistic and paralinguistic choices. Most buildings appears to have their own watermaster, or at least their own cabal of like-minded watermasters. Here are two watersigns from the Esg building, the first of which is present on multiple floors. This watermaster boldly personifies the non-drain, quite distinct from the choices of other watermasters. One must wonder if there is perhaps some schism among those of the craft. Compared to the polite and gentle words of the Notsuoh masters, the Retnec Darg signs seem quite unorthodox, perhaps even heretical. There is an additional directive here, at the upper right of the device, that seems embellished by some kind of yellow dye. 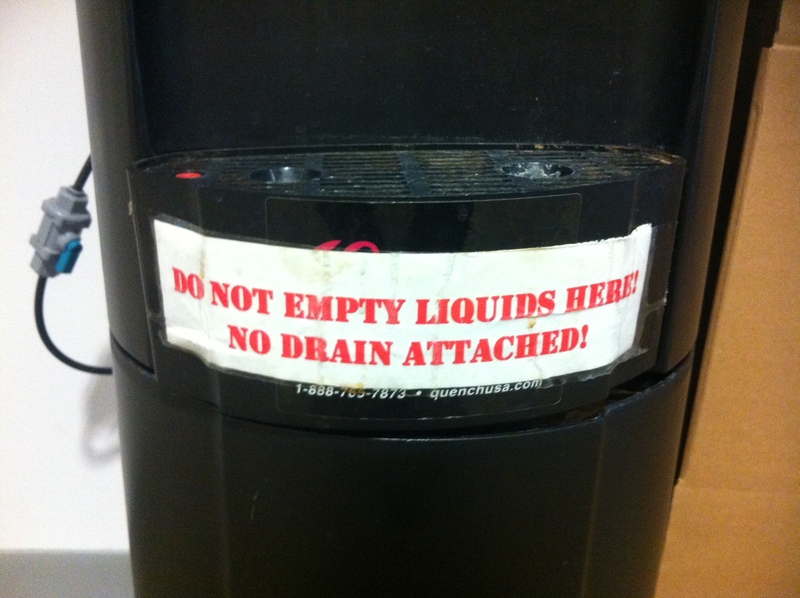 This directive gives precise instructions for proper use of the water cooler, which other coolers have lacked. Perhaps the yellow dye is used to highlight signs of particular ritual importance. The emotive homunculus is visible there also, as are several features employed by some, but not all, of the other watermasters whose work is presented here. Only a preliminary investigation of Nnepu water signage was possible. Yet even these limited data reveal much about this polysemic people. Surely with such a variety of features employed accomplishing the common purpose of ritual water description, we see the workings of years of careful and deliberate training in the Drain Mysteries. Don’t worry, don’t worry, it’s over now. The bad man made of straw is gone. Remember, back in the real world, only YOU can prevent exotification of cultural complexity inherent in all human life. Let this be a warning! And next time you see that someone has taken the time to tell you how to use a water cooler, have some appreciation for their vast and deeply multimodal communicative repertoires. It’s not weird, it’s just how things work. That should be exciting enough. Bakhtin, M. (1981). Discourse in the Novel. In M. Holquist (Trans. ), The dialogic imagination: four essays. Austin: Univ. of Texas Press. Miner, H. (1956). Body ritual among the Nacirema. American Anthropologist 58, 503-507.